Richmond's Big Night in Presidential Politics | 30th Anniversary Issue | Style Weekly - Richmond, VA local news, arts, and events. It was too much fun. With media outnumbering everyone else by nearly 10 to one, it was hard not to gawk, and harder still to see a few of The Famous ones up close and personal. Poor old John Chancellor, aging ungracefully, struggled to climb the ladder-like steps to the NBC platform where he joined trim, tan Tom Brokaw, who (we lamented) looks better on camera. Andrea Mitchell, her face embalmed by gobs of pancake makeup, showed signs of being on the campaign trail too long. Chuck Robb, bless his heart, rarely seen around town these days, looked thin and, well, no longer boyish. Lynda, who didn't get a ticket, joined the senator later at the post-debate Clinton rally downtown. On the other hand, a contented-looking Jerry Baliles, in jovial mood, hung around front warmly greeting arriving locals Ric Arenstein, S & K's Stuart Siegel, CSX's Hays Watkins and the Claiborne Robins Jrs., among others. Signet execs Bob Freeman and Mac MacDonald were spotted chuckling and cutting a path to the UR Commons to watch the debate on TV, while wives Peg and Sonya made off with their Robins Center tickets. Other faces in the crowd: The Governor and Don Beyer, Mary Sue, of course (who the Lt. Gov. 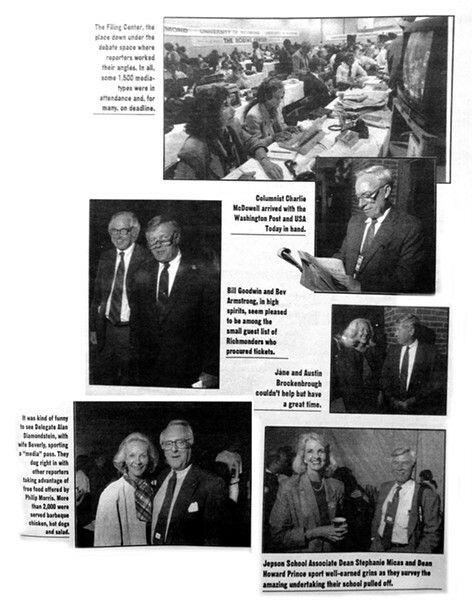 introduced the next day as "the next governor of Virginia"); plus Annie and Gil Rosenthal of Standard Drug, American Tobacco's John Hager and the Metro Chamber's Jim Dunn and former Virginia State Senator and First Lady Eddy Dalton. And where were you? Watching on the tube, we presume.